Today, Woking Football Club announced at a press conference held at the new Geoff Chapple Lounge that Woking FC will play at the newly renamed Laithwaite Community Stadium this season. 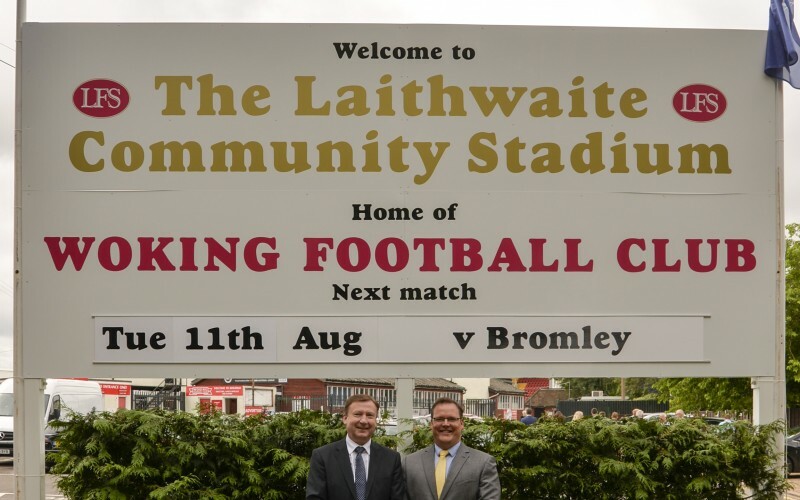 Managing Director of Laithwaite Financial Services Ltd, Andrew Laithwaite explained that the renaming of the stadium is the club showing it is going in the right direction. He said, “Renaming the ground to The Laithwaite Community Stadium represents a significant and very important change, which will put us on a stronger financial footing going forward and allow us to focus on giving our best performance on the pitch. The deal between Woking Football Club and Laithwaite Financial Services LTD is a two year deal, with a further option to continue ownership of the stadiums name when the original deal expires. On the subject of matters on the field, Mike Smith explained that the club and manager Gary Hill have agreed on the budget and look to strengthen the squad where it is needed most. Woking kick start their season with a trip up to former Football League side Tranmere. Be sure to tune into Radio Woking every Saturday live from 2pm on the Saturday sports show. Photos are from the Woking FC website taken by David Holmes.